Alex gives it his all, yet he still can’t muster a smile. And with this cover, Alex’s fate in America was sealed. 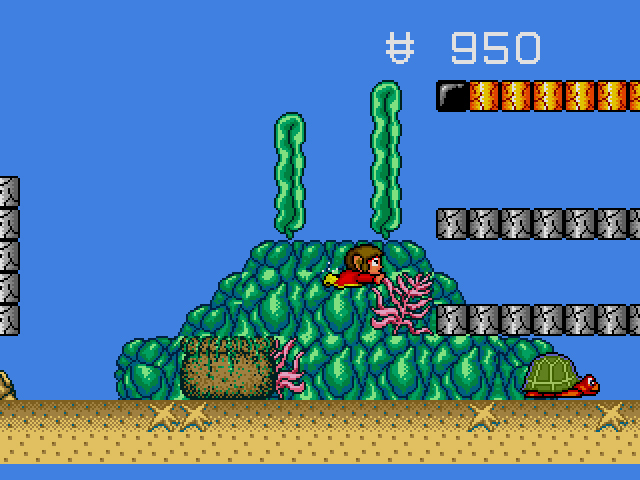 In 1986, Alex Kidd in Miracle World stretched the boundaries of the run-fast-and-hit-things platforming formula established by Mario. Alex bought items to help him in his quest. He rode vehicles. Lack of a time limit allowed him to leisurely explore the vast levels. From Miracle World on, however, Sega truly had no idea what to do with the character. They threw him into a Japan-only BMX game. They crafted a more Mario-like platformer with The Lost Stars. 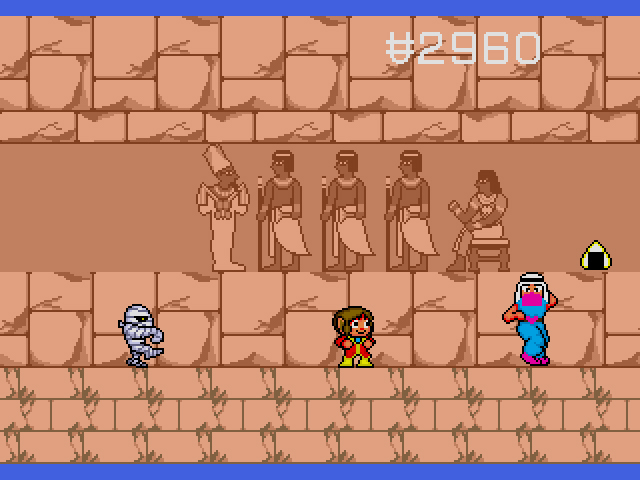 And they did a sprite switch for Alex Kidd in High-Tech World, originally titled Anmitsu Hime. Finally, with the advent of the Mega Drive/Genesis in 1989, Sega gave Alex Kidd fans what they assumed they wanted: a proper Miracle World sequel. Well, at least the animals are having a good time. Now imagine that, for Super Mario World, Nintendo released a prettier, watered-down version of the original Super Mario Bros. 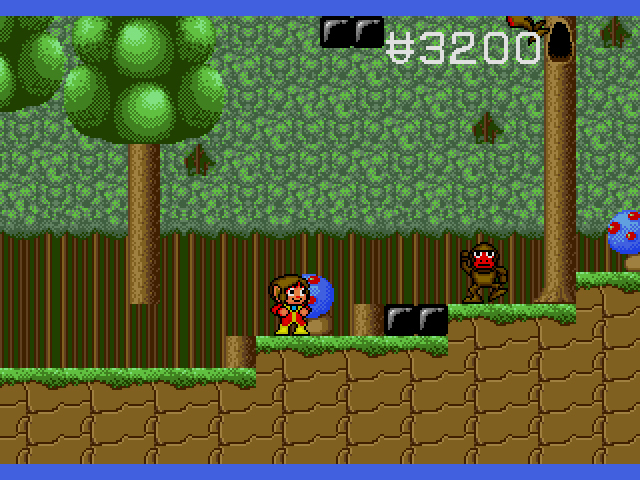 This is Alex Kidd in the Enchanted Castle. 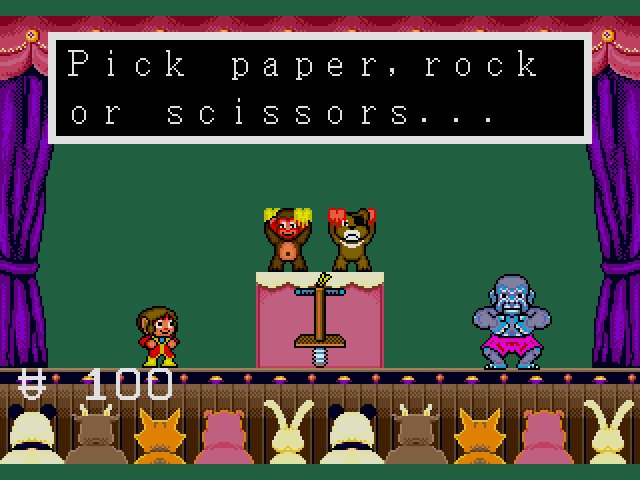 Enchanted Castle has almost all the features that make Miracle World unique: Rock, Paper, Scissor boss matches, methodical platforming, and a variety of locales. But the inspiration and depth that made Miracle World such a singular work in 1986 are gone. Not even your exquisite synchronized swimming abilities can hold my interest, Alex. 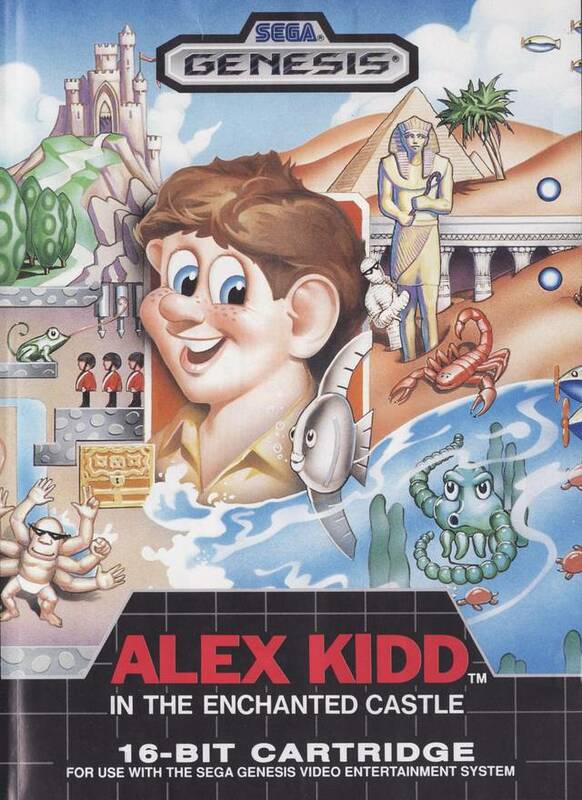 Check the title: Alex Kidd in the Enchanted Castle. Sounds like you’re gonna be wandering through a castle for most of the game, right? Well, ten of the game’s eleven levels take place outside of this Enchanted Castle. These levels are short and uninspired. 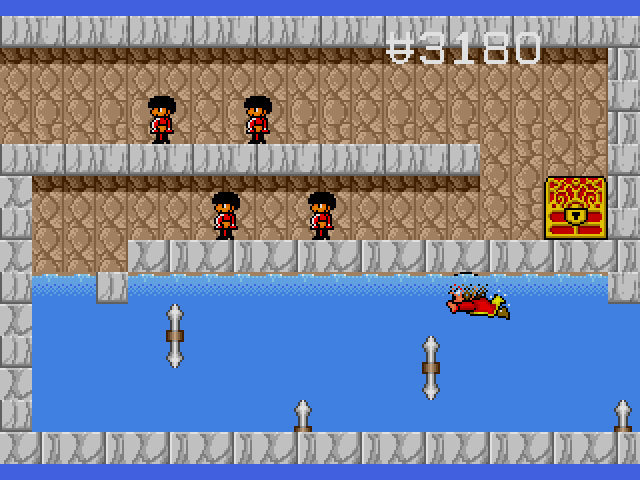 They involve nothing more than jumping from block to block, punching the occasional enemy and treasure chest, and collecting the rice ball at the end. There is little in the way of varied gameplay, and while there are hidden underground areas and alternate paths, the levels aren’t memorable enough to warrant repeat visits. Only when you arrive at the Enchanted Castle – with its significant length, incredible difficulty, and innovative room design – does it feel like Sega gives a damn about the game. One of the many enjoyable rooms in the Enchanted Castle. Alex is still the same old gangsta. His fat head keeps him cute, his big fist helps him attack and win Rock, Paper, Scissors matches, and his weak frame means he only needs one hit to die. As in Miracle World, you have to get right up in an enemy’s personal bubble to hit them unless you have the projectile-spewing Power Bracelet. Alex does have one new move, an automatic power kick that occurs every time he jumps. While not a terrible addition, it makes for some awkward maneuvering when you’re trying to land on brick platforms that can be destroyed by said kicks. The kicks don’t seem to register very well as attacks, either. During my playthrough, nearly every time Alex jump kicked towards a flying enemy, the enemy didn’t feel the weight of his foot in its face and Alex died. The biggest change between Miracle World and Enchanted Castle feels like a failed ploy to extend the game’s length. Instead of shopping for items and using them as you go, you now pay to play Rock, Paper, Scissors matches for items. If you fail a match, you have to pay again for a chance to win them. To be fair, money is everywhere in this game. You could enter into an RPS match, exit out of it, collect some money from treasure chests, then go back to the match and repeat until you have a bundle. This grinding shouldn’t be necessary, though. In Miracle World, you walked into a shop, bought the item, and used it instantly; no wasting time/resources on matches of chance. Also, unlike Miracle World where every item had a purpose, I never used any items outside the Power Bracelet (shoots projectiles out of your fist), the Invisibility Cape (perfect for Ashra, the final boss), and the Pedicopter (much harder to control than in Miracle World). Perhaps the other items (like the new Pogo Stick) aren’t useless, but I didn’t need them to beat the game. 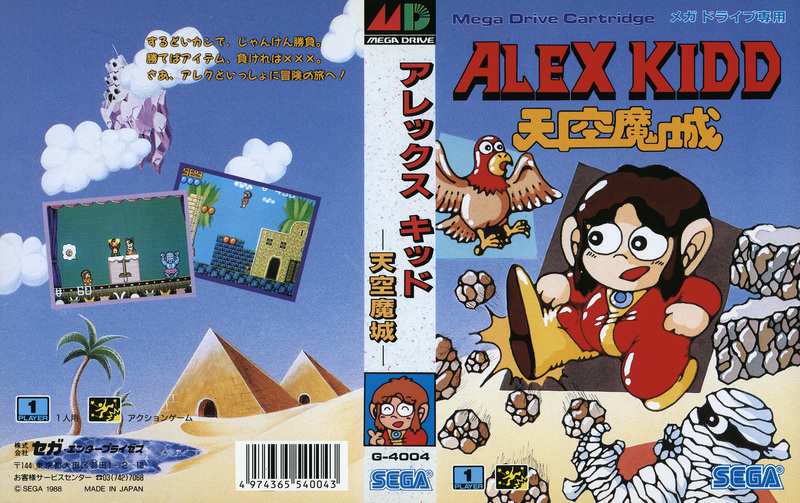 Now check this title: Alex Kidd in Miracle World. In Miracle World, you explored all of Miracle World (otherwise known as Planet Aeries). Better still, all seventeen levels of Miracle World are worth exploring. If I may quote my Miracle World review: “Planet Aeries’ landscape is more colorful and varied… with no two levels resembling each other. Mt. Eternal has Alex progressing downwards through a mountain and into a body of water, then swimming his way out. The Blakwoods is a dense forest where monkeys throw seeds at you. Radaxian Castle is a puzzle-filled, non-linear maze, while the Kingdom of Nibana forces you to ride your Peticopter through dangerous red-orbed filled skies.” Even amidst a relentless difficulty, Miracle World consistently engages you and leaves you wanting more. 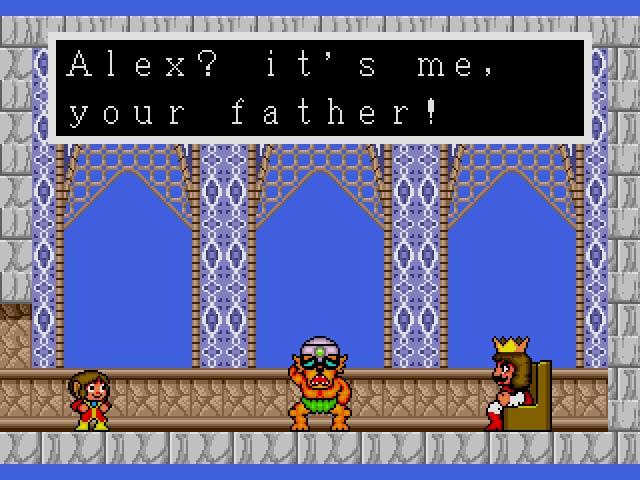 Alex Kidd in the Enchanted Castle isn’t a horrible game, just a disappointing one. It has uneven difficulty, it’s surprisingly ugly even for an early Mega Drive game, and the halfhearted gameplay is several steps backward for the franchise. Miracle World was a carefully crafted platformer designed to sell the Master System to wary consumers. Enchanted Castle was a rushed afterthought, designed to keep early adopters of the Mega Drive/Genesis preoccupied until Sega could come up with something better. Alex’s father’s name is Thor. Thor Kidd. 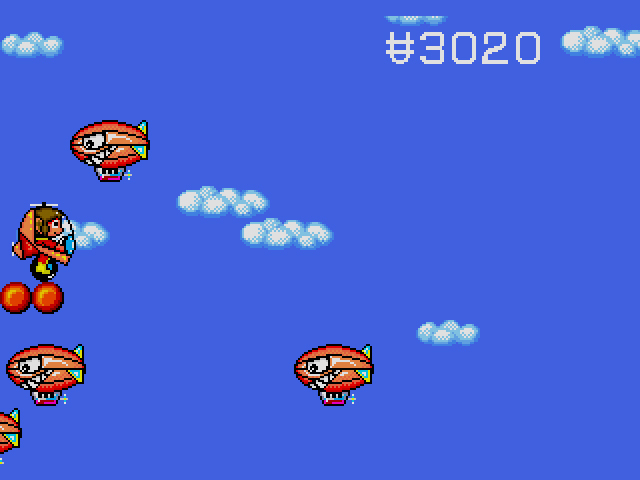 After the 1990 title Alex Kidd in Shinobi World, Sega never bothered with the series again, outside of the occasional cameo. For a character that was four years old and had several games, yet never rose above cult status, it’s easy to see why Sega felt the need to start from scratch with Sonic. Enchanted Castle is a sad sort of failure: an exhausting stab at continued relevance from a mascot that, despite his youth, already seemed washed up. Couldn’t agree more it’s very poor for a 16-bit title. I played through it once and will never do so again. At least Alex went out in style! You’ll be in for a treat, when Shinobi World is up for review Dylan! One of my favorite 8bit games! With both this game and “Miracle World” being solid classics and you giving “Lost Stars” a b+ (I haven’t played it myself though), Alex’ Maste System run actually looks rather decent! That ambitious games like “A.K in Schinobi World” were still being released for the SMS in 1990, proofs that the Master System hadn’t become an afterthought for Sega in the early nineties. With a bunch of Mega Drive reviews coming up on this site and the happy-to-move-on-from-the-SMS-transition it seems to mark here; I feel that some have reached conclusions way to early on the console! I guess what I want to say is that the theoretical concept of “console generations” isn’t always as readily apllicable for earlier times as it is for today. I get though that you guys (US citizens) sadly missed out on most that was yet to come! Sean may correct me on this, but by 1989, the Master System was pretty much dead in America. The NES was hitting its peak and Sega was moving on with the Genesis. I’ll be interested to play a lot of the European only Master System games from ’90 and beyond. Well, it did get a push after 89 and like I said it helped with GG ports. But I don’t think the audience was very large. Enjoyed your review, really summed Enchanted Castle up. I’ve always seen it as a weak copy of Miracle World, like a second rate band ruining a cover song. Thanks! That’s a very apt description. I never played Enchanted Castle, and don’t even remember having seen it on store shelves by the time I got my Genesis in ’91. I dabbled with it years later in emulation just briefly, but found it to be pretty underwhelming. Playing it more “for real” via the Sonic’s Ultimate Genesis Collection, I still find it to be underwhelming, and pretty average, at best. I think you hit the nail on the head – it looks and plays like a thrown together sequel to Miracle World, but not a fully realized game. I’ve never felt like the Rock/Paper/Scissors boss fight approach was a good idea, so with this title’s less than inspiring level design, it just makes that mechanic seem all the more flawed. And the cover art…they could have easily called the game “Generic Protagonist #5 in the Land of Quasi-Fantastical Random Crap” and no one, save for the Alex Kidd diehards (all 8 of them) would have been the wiser. I do plan on playing through this game at some point, just to get an idea of what early Genesis adopters would have had to deal with, but honestly, it will most likely be to satiate my own historical curiosity, more than anything. Sega sealed poor Alex’s fate with this game. I’d say it’s a shame, but better that Alex retire than have him be bundled in a bunch of terrible crap like Sega does with Sonic. I would say this game is not as bad as a D, it throughly an average game. Maybe a C is as high as I’d go. It doesn’t really have the adventure elements that Miracle world did, and is not as good a Platformer as Lost Stars. But. I really like the enchanted castle stages at the end, when it turns into more of a puzzle Platformer with multiple path stage design. When I got this, I really just though, eh nothing special. I didn’t hate it, but it not something I would revisit again after beating. Sure it has shiny 16-bit graphics, but the gameplay is pretty shallow. I too really liked the Enchanted Castle stage at the end. It felt like it hailed from a different game. Imagine if every level had that much thought put into it! I’ve never been a huge Alex Kidd fan, but he’s had some good games. I was shocked by how much I didn’t like Enchanted Castle. With the exception of the last level, Sega really wasn’t trying with this one at all. What Pieter said, but substituting Australia for Belgium. I got my SMS for Christmas 1990 and there were a heap of great games released in PAL territories in the couple of years after that. Re Enchanted Cattle (aurocorrected typo left in because it made me chuckle): this is a game I’d always wanted to play. I think it got a 9/10 review on Sega16, and I really like Miracle and Shinobi Worlds. I finally let myself “savour” it a few years ago via PSP. Imagine my disappointment.